Have a question about vet medicine? Get in touch and we'll make a post or video! Heartworm Disease: Kind of a Big Deal! Over two years ago when I moved to Texas from Massachusetts, I knew that many things would be different. I readily acclimated to the tacos, BBQ, and lake life, but what continues to amaze me is the number of ways that Texas tries to hurt us! Between the snakes, scorpions, stifling hot summers, and I-35, it's a wonder that any of us are still standing! With our warm climate, Texas is a hotbed (literally) for many infectious diseases. Now one of the saddest things I've seen since being a veterinarian in Central Texas is the huge number of dogs infected with heartworms. It's so important that every pet owner in the country (and especially in the Southern states) is aware of heartworm disease and its seriousness. This is a preventable disease! Yes! Dogs can become infected with the influenza virus! This has been a hot topic in the Austin area within the past couple of months, so you may have already heard about these infections on the news or in your community. Here we’ll discuss basic information about the influenza virus, signs of disease, and what you can do to protect your dog. Talk nerdy to me: what is the canine influenza virus? Dr Jenna is now Fear Free Certified! Can you imagine your dog or cat absolutely LOVING their vet visit? 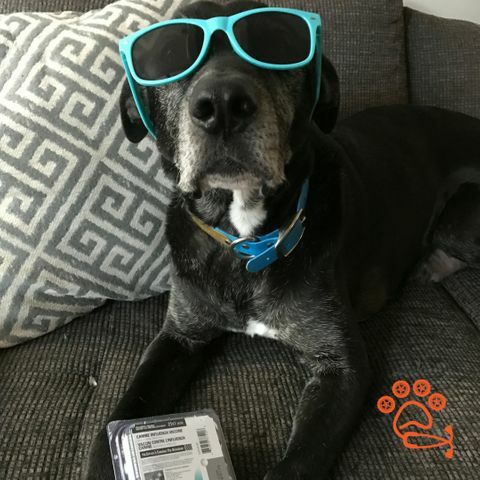 You won't need to imagine if you call Dr. Jenna with Vet Around Town in Austin TX. That’s because she is part of a new initiative sweeping veterinary medicine designed to ease the stress, fear, and anxiety so many pets experience during vet visits. Known as Fear Free, the training and certification program helps veterinarians modify their procedures, handling, and facilities to help pets feel safe and comfortable while receiving the medical care they need. Dr. Jenna recognized the need for low-stress vet visits when she designed her house call veterinary practice. She was thrilled to hear about the Fear Free program to learn even more methods for helping pets develop positive associations with their veterinarian. Four days ago I received a panicked call from Murphy's mom. He was suddenly unable to walk that morning and she wasn't sure what had happened! Murphy is a 7 year old mixed breed dog who has otherwise been healthy his whole life. There was no chance for any recent trauma or toxicity. I arrived to their home that day to perform a full physical exam. This showed that he had neurologic deficits in all four limbs, which were most notable on the right forelimb. "Deficits" occur when there is a block in signal from the body to the brain. When our limbs move, the nerves signal to the brain letting us know where to go and how to move the limbs. In Murphy's case, he was knuckling over on his paws and criss-crossing his limbs as a result of this impaired signaling from the limbs to the brain. Because of this incoordination, he could not walk at all. Clearly, I can't get enough of my Golden Retriever patients. They are always so happy and sweet, and there's just something about them that cheers up my entire day! If you've ever met a Golden Retriever you must understand what I'm talking about. A couple weeks ago I was lucky enough to meet 9 year old Finnegan, who was having a VERY common issue this time of year - itchy skin. Poor Finnegan was bothered by an itch on his leg so badly that within just a day he had licked and chewed it into a very red, raw "hot spot". At the same time, we found that Finnegan had ear infections in both ears! Unfortunately, Finnegan was no stranger to these problems; they seem to happen around the same time every year. 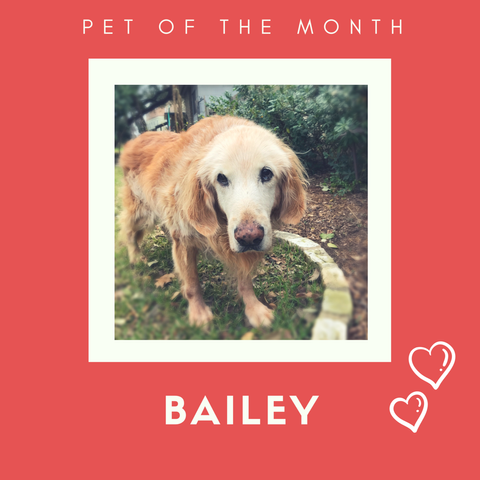 Pet of the Month: BAILEY! Bailey is a 15 year old Golden Retriever, who in typical Golden fashion, always greets us with a happy smile and tail wag. He enjoys life with an amazing family including two small kids and another on the way! Bailey is such a lover that he was the perfect choice for our February pet of the month! A few weeks back while I was working in the ER, a 6 year old neutered male German Shepherd dog was rushed into the hospital after collapsing at home. Sadly, this dog arrived DOA (deceased on arrival). Our team immediately performed CPR but were ultimately unable to resuscitate him. On initial evaluation, we were able to quickly diagnose a condition called gastric dilatation and volvulus (GDV, aka "bloat"). Upon further questioning of the owners, I learned that this handsome boy had been showing many classic signs of GDV over the previous 8 hours that day. When I discussed my diagnosis, they had never heard of it before and asked, "isn't there some treatment or surgery that can be done?" It was so difficult to tell them that yes, there IS a life-saving treatment for this condition, however at this point it was far too late. Had they brought him to me only a couple hours sooner, he likely could have been saved. With 2016 running for the door, many of us are looking forward to celebrating New Year’s Eve and welcoming a fresh start for 2017. 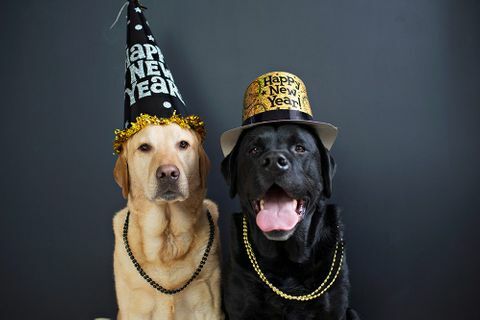 Whether you’re staying in for the night or going out on the town, it’s important to be prepared with a plan to help your pet enjoy the celebration as much as you will! Let’s talk about a few main points to help us all get through to the New Year without too much regret. 1. Safety First: Sometimes it’s hard to feel fabulous amidst a pack of people dressed in glitter! If your pet is more of an introvert than life of the party, be sure to provide a safe spot where she can retreat to if the festivities become overwhelming. A separate room or a crate with plenty of treats and puzzle toys can provide a great distraction and keep her feeling safe. We love using Kong toys filled with peanut butter and treats! Vet Around Town - Intro! Hello, Austin! 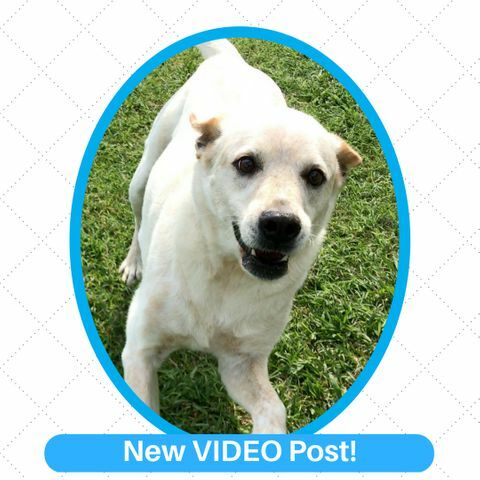 I'm so excited to be your vet and made this video so that you could "meet" me right away! Stay tuned for cuteness overload at the end!